The following are nuggets of knowledge about cheese, which were for me new realizations. Perhaps you’ll find few new things about cheese that you’ve never known, too, which might enhance your experience with cheese (and wine) a bit more. * High alcohol wines do better with robust cheese (lingering the tasting experience); one note wines do better with light cheeses (shortening the tasting experience). * Cheeses also balance sweet with acidity. * Cheese ages from the rind inward. Around the rind, the cheese is aged more and is more firm, getting softer as it heads toward the middle, because of the aging process. Laura suggested that people taste cheese from the middle first, for the best impression. * A wheel of cheese must be kept in tact, otherwise it begins to deteriorate. * There are three classifications of cheese: Artisan (hand made with this tradition going back 1,000 years), Farmstead (this cheese has cows being raised on the property from which the cheese is going to be made), and commodity (big business, hundreds of animals, and is a much lower cost). * Cheese has a rice flower coating, and this is what creates the rind. This is a living process (cheese like wine is a living substance). * As cheese ages the rind becomes more solid. * Bill added that the bread that he would be serving with the cheese would be a sweet baguette, because a sour dough one would interfere with the tasting process, while the sweeter bread would serve to cleanse our palates. But you do have to wonder – is there really some chemical health benefit? Or maybe it’s simply that those of us who drink wine have learned to relax and enjoy our lives more. I’ve always been (fascinated? intrigued?) by those people you meet who are always pinched and uptight about everything and they never seem to get any joy out of life. Contrast that to those who embrace all that life offers and seem to be some of the happiest people I know, enjoying every opportunity that presents itself – whether they’re skydiving or simply sipping a very nice Malbec on the back deck and watching butterflies. Considering that every healthy baby I’ve ever seen smiled a lot – you have to wonder where things turned for those who never learned to enjoy this time that we’ve got. And now we’ve got even more reason – simply enjoying life may actually let you have more of it to enjoy! Men who drink up to half a glass of wine a day may live five years longer than teetotalers, according to a Dutch study published online Thursday by the Journal of Epidemiology and Community Health. The study also concluded that men who consumed light-to-moderate quantities (about 20 grams) of any type of alcohol daily gained two and a half years of life expectancy, with a lower risk of dying from coronary heart disease and other ailments associated with poor circulation. As the temperatures begin to rise and summer approaches, we tend to graviate towards light fare that invigorates and inspires our minds and bodies. Those same temperatures tend to focus our being on lightly chilled wines and light foods that lift us into inspiration. 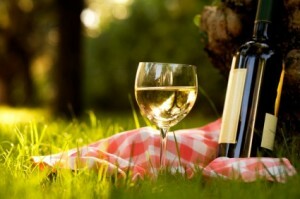 This evening we will tempt and tease our palates with those great summer wines. Food pairings will be some of our favorites – simple and light with chilled dill pasta and lightly herbed melon with serano ham. Recipes will be provided, if you’d like to share the favorite one you take to the many summertime parties, bring along a copy and we’ll be happy to recommend some wines to highlight it as well. In the end, we ask you come prepared to relax, enjoy and celebrate the classic flavors of summer with us. First corks made from non-cork materials – now bottles made from stainless steel? An interesting approach to making wine more sustainably – one that works for small producers selling in their local market certainly, but is it something that could be ramped up to a larger operation? Is it even possible to have a larger operation be considered sustainable – and if so, what practices are going to have to be reworked? Regulators scoffed. Kelley sent cellar records showing he hadn’t used a single additive. He got two choices: ditch the language, or get his label rejected. The National Process Alliance wines have quickly become one of California wine’s most compelling developments since they began appearing in restaurants a few weeks ago. The bottles give it away: stainless-steel water canisters from Chico-based Klean Kanteen. Kelley delivers them filled and retrieves them empty, a modern-day dairyman of sorts. Christopher’s Wine and Cheese is honored to host Bourgeois Family Selections on Friday, May 22th at 5:30 pm in a tasting of their new releases. This winemaker’s program is made available to you at a cost of $15.00 person; reservations may be made by calling Christopher’s Wine and Cheese at828-414-9111, or 866-713-9437 for our guests visiting from out of town. Over the course of my adult life, I’ve lived in places that had plenty of storage – and during the thriftier years, places that had almost none. One of the problems of trying to keep more than a bottle or two of the current favorite vino on hand has been the amount of space that the various wine racks take up. If you’ve got enough room to give up the floorspace (or even more precious – the countertop) then there are plenty of choices out there in every budget imaginable. But when you don’t, it’s pretty tough not to use the only space you can give up – on top of the refrigerator (I just shudder to think what the temperature swings and vibrations were doing) – for years I never could find something that would work better – until now. Called a Wine Tube, it’s one of those “slap your forehead and wonder why you didn’t think of it first” simple concepts that fit in so many different ways. A satin polished metal tube with holes along the sides allows you to mount this right up against the wall – it holds 12 bottles, you can turn the lables to where they’re easily seen and it’s artistic in it’s own right. But best of all, it takes up no more room on your wall than any pictures you’d hang. We mounted it to the end of our tasting bar using the screws provided – if you want to put it on a wall and the location you’ve picked out won’t have the screws going directly into a stud then talk to the company about getting the toggle bolt option instead – just to support the weight properly. You can get them from Wine-Wall who I found a pleasure to work with and very responsive to my emails when I had questions. Boone Pride is holding a wine tasting benefit at Christopher’s Wine & Cheese in Blowing Rock on Saturday, May 23, from 5:00 to 8:00 p.m. Spouses, partners, prospective members and friends are welcome to attend. Wine flights will be sold for $10 that you can use on three wine tastings of your choice from special selections. Light hors d’oeuvres will also be served. Space is limited; please call 828-414-9111 for more info and to reserve your space.